Are you suffering from an overabundance of gorgeous, ripe, heirloom tomatoes? 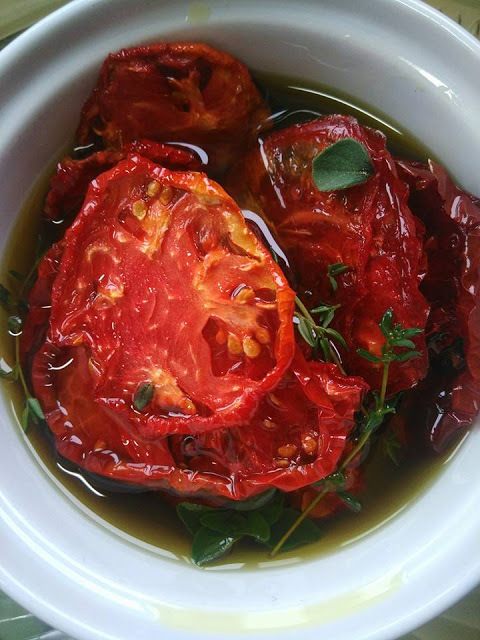 If you answered yes, then consider preserving your harvest by oven drying your tomatoes and then jarring them with a superlative, fresh UP EVOO and herbs. If you answered no, get yourself some late summer tomatoes, stat! It doesn't get easier than this, and the results are spectacular. Serve them as an appetizer, blend them with garlic for a "sun-dried" style tomato pesto sauce, or enjoy them for snacking straight out of the jar. Start with 2-3 pounds of ripe summer tomatoes. Line a couple of baking sheets with parchment paper. Cut the tomatoes in half and sprinkle with a little sea salt. Bake the tomatoes slow and low at 250 F. for 4-5 hours. Allow the tomatoes to cool completely before packing them into clean jars with lids, stuffed with an assortment of fresh herbs of your choice. I like to use thyme, oregano, and/or rosemary. Cover the tomatoes fully with a fresh UP EVOO of our choice, and refrigerate for up to 3 weeks. They won't last that long however, we can guarantee it!